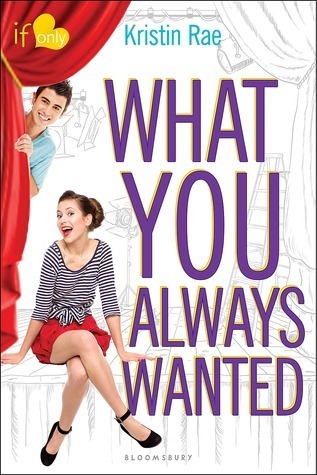 What You Always Wanted is definitely something I've always wanted to read when it comes to YA contemporaries. I was pleasantly surprised by how much depth is soaked into the pages of what could have been just a light, airy read. Kristin Rae has a talent of creating a story that so many can relate to, yet adding substance to keep it unique and personal. I adored her debut novel, Wish You Were Italian, for the same reasons, and she's done it again with her sophomore novel. Maddie has just moved to Texas from her life in Chicago with her parents. She's been uprooted in the middle of her high school career, leaving behind a life on stage, yet bringing her love for classic movies and musicals with her. As someone who is familiar with the genre of Gene Kelly and Fred Astaire, but not necessarily a frequent viewer of their talents, I found it educational and fun to learn more about it as its sprinkled throughout the novel. She is a fish in a brand new pond and instead of being afraid, she takes this opportunity to reinvent herself -- which is something I really admired. I loved her unique, quirky personality, and how it became so infectious to those she was around. As she settles into her new life, she's also making new friends and goals for herself. What she thought she may have wanted for herself has a funny way of showing itself when she least expects it. There's enough character growth to give this story a well-rounded, over-all enjoyable experience. We see Maddie evolve through her new experiences, but we also see her question these changes, which so many can relate to. What You Always Wanted shines bright on the literary stage, possessing a story I'll want to revisit time and time again. I absolutely adored What You Always Wanted! I definitely agree about it being light but also substantial - and it seems like this is just Kristin Rae's style. I loved Maddie and her story so, so much, and could relate to it a lot too. Glad you loved it as well, Ginger!